Since its foundation in 2003, the Microproducts Breakthrough Institute (MBI) has served as a home for the School of MIME’s advanced manufacturing research breakthroughs. MBI is a collaborative space focused on the research, development and commercialization of microchannel technology. 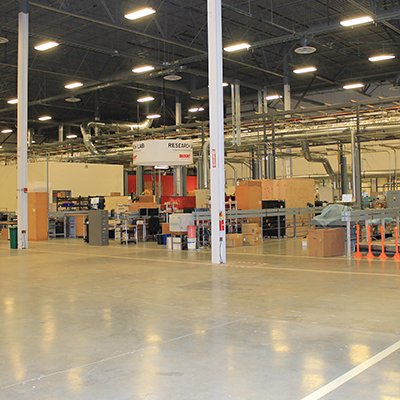 The MBI is housed in a 70,000-square-foot building with research and development laboratories, fabrication facilities and offices for MIME and OSU faculty as well as a bevy of industry tenants representing a range of manufacturing sectors. Research activity in the MBI has involved primarily two schools of engineering, MIME and CBEE, leading to breakthroughs in microchannel and nanotechnology for sustainable energy, biomedical devices, and chemical production. But another important aspect of MBI’s activities navigates the rough waters of commercialization — e.g., the development and scale up of products and processes in partnership with new startup companies or existing business. For that reason, Paul explains, the OSU Research Office has launched a broader institute called ATAMI to expand on the success of the MBI to translate research into industry. ATAMI, or the “Advanced Technology and Manufacturing Institute” is under the leadership of Dr. Sam Angelos, the prior VP and site manager for HP Corvallis. “We are looking to connect the dots among the big programs at Oregon State, and expand to other colleges, for example, the Colleges of Science, Business, Forestry. We want the best and the brightest, and we’d like more opportunities to commercialize research across the entire university,” said Angelos. ATAMI has the scope to accommodate broader, deeper pockets of research excellence from other colleges. New programs at ATAMI include research and development in semiconductor manufacturing and the ‘internet-of-things’ as well as new techniques for 3D printing, machining and forming. “Our message to OSU faculty is that if you are working on hardware, ATAMI is a place for you. We still have 25,000 to 30,000 square feet of open high-bay research space that needs programming,” said Paul. The MBI will remain as one of several programs advancing technology to market within ATAMI. Over the past years, the MBI has brought in approximately $28 million in R&D expenditures, launched 10 startup or spinout companies, and secured eight licensing agreements, an impressive set of accomplishments for a small cluster of businesses and researchers. And according to Paul, ATAMI has a strong future because of the proven track record of the MBI. “Through the MBI, and now ATAMI, we in the state of Oregon are becoming more aware that we can grow our own businesses. Entrepreneurs are more aware of the expanding infrastructure to help them get started including ONAMI, Vertue Lab and the campus accelerator. We are taking what we learned in the original partnership of two schools and PNNL, and seeking to scale that up to the university level,” Paul said. Activities at ATAMI and MBI will continue to involve industry and government research that enables graduate education. Companies like Boeing and Blount are sponsoring research with MIME faculty Rajiv Malhotra and Karl Haapala. The U.S. DOE’s SunShot Initiative has funded projects with MIME faculty to optimize and scale up concentrated solar thermal energy. Dr. Paul and retired Associate Professor Kevin Drost are working with other MIME researchers including Brian Fronk, and Sourabh Apte to conduct this research. Other entities supporting MBI include the National Institutes of Health, the U.S. Army, the Department of Energy Advanced Research Projects Agency and the National Science Foundation. Beyond grants, patents, theses and students, ATAMI, in partnership with ONAMI, VertueLab and regional accelerators, offers the opportunity for companies to innovate faster. According to Paul, these entities help bring entrepreneurs-in-residence intended to help researchers make the extra leap to commercialization. Collaboration with entrepreneurs is key to moving the mission of ATAMI forward. The expected outcome of greater collaboration is job creation in Oregon through the launching of new companies and assistance to existing manufacturers in the state. This will lead to more success stories, like that of Voxtel, a small Oregon company that partnered with OSU researchers, through an ONAMI gap grant, to create a new process for scaling up the production of precision quantum dots. The new process has led to the establishment of Shoei Electronic Materials Inc. (SEMI), a new division of Japan-based Shoei Chemical Inc. within Oregon. Research on advanced energy recovery, conversion and storage to improve overall energy efficiency and enable renewables, through innovative system and component designs, with focus on engine waste heat recovery, flexible power and cooling, and high flux microchannel heat exchangers.